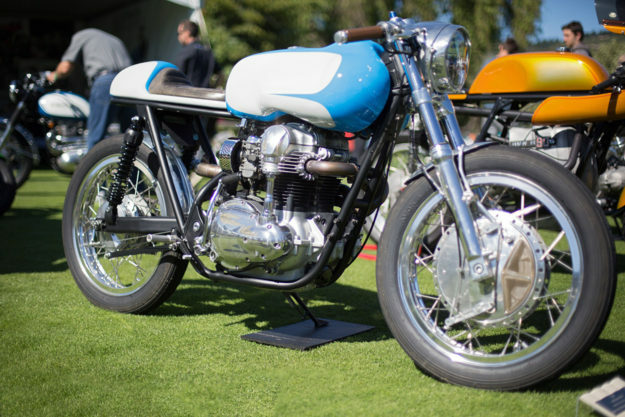 For motorcycle fans on the west coast of the USA, there’s one event you can’t miss: The Quail Motorcycle Gathering in sunny Carmel, California. 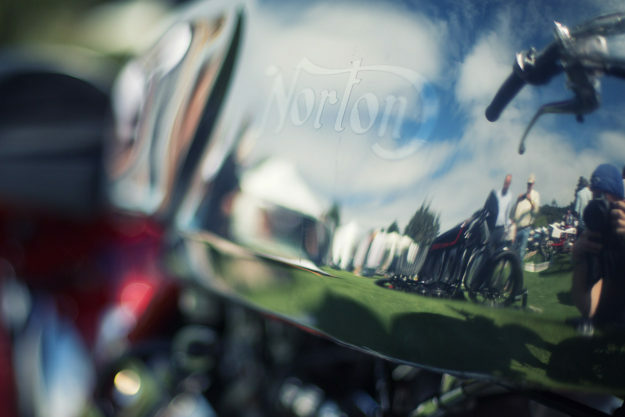 The 2016 show was the most successful in the eight-year history of the Concours d’Elegance. 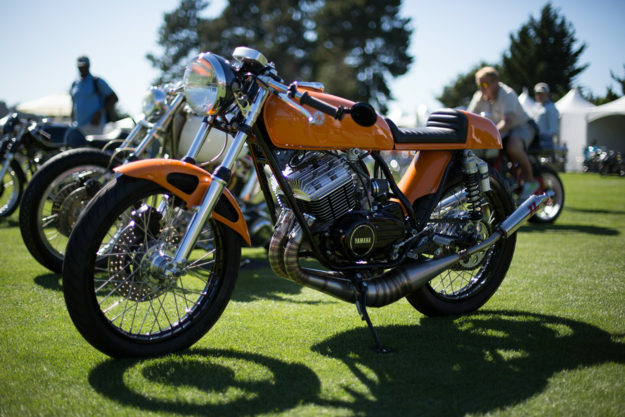 The manicured lawns played host to 400 display bikes, with an upgraded Custom/Modified class to cater for the growing custom scene. 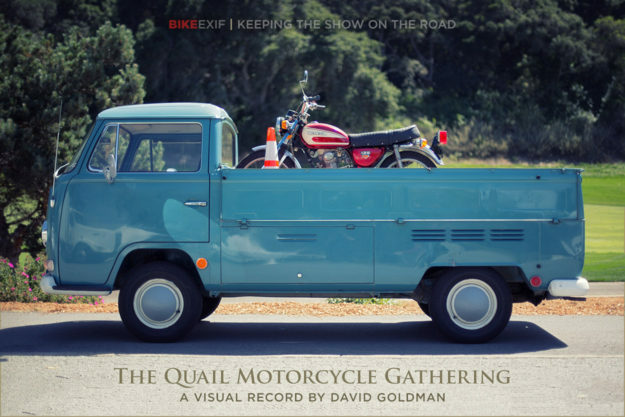 Photographer David Goldman was on hand to capture the magic for us. Here’s a personal selection of favorites. 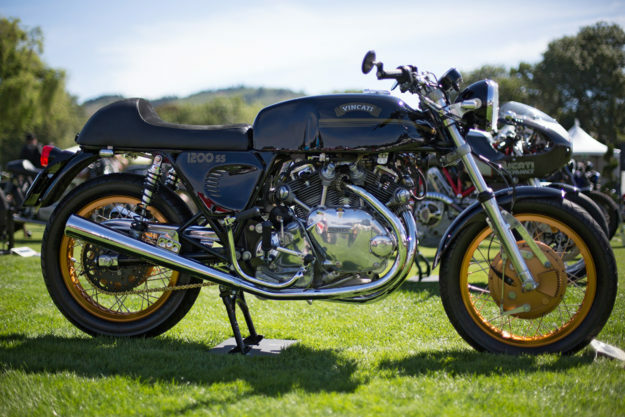 Kawasaki W1 650 by Mike LaFountain of Raccia Motorcycles, customized to echo the iconic Matchless G45. This machine took Mike seven years to complete. 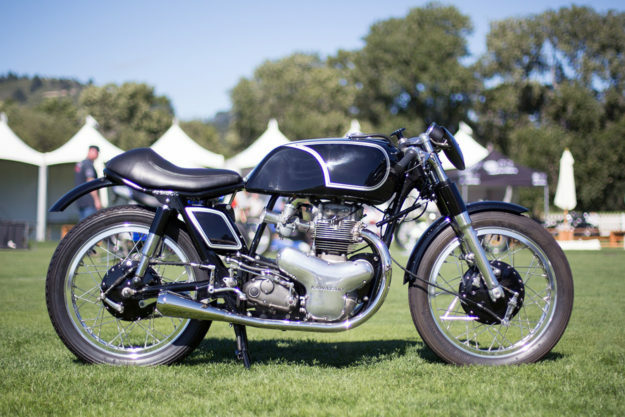 ‘The Bean’ by Revival Cycles—a heavily modified Kawasaki W650. The tank is a homage to the classic Ducati ‘Jelly Mold’ design but the forks are decidedly modern Yamaha R6 units. 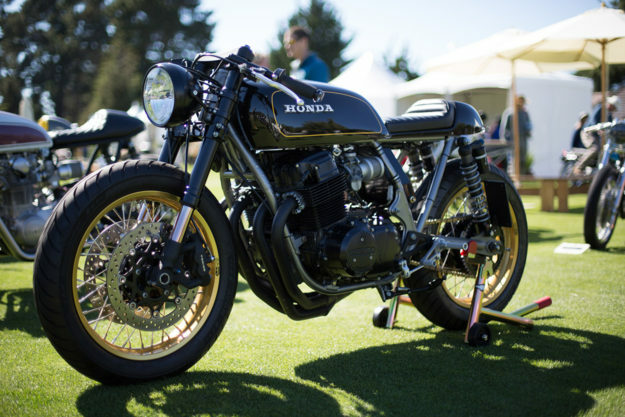 Devin Henriques of Cognito Moto showed a pair of stunning builds, leading with this CB750. 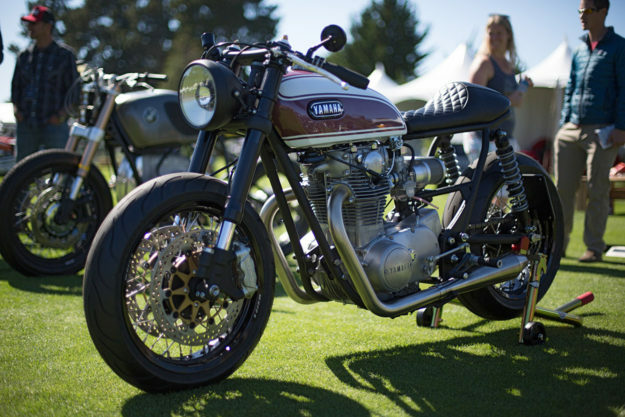 The tank is from a later model CB750F, the wheels are 18-inch Sun rims, and the forks are from a Suzuki GSX-R 750. Cognito’s second machine was this equally beefy Yamaha XS650, topped off with a lovely quilted seat from New Church Moto. We love those straight-shootin’ pipes too. 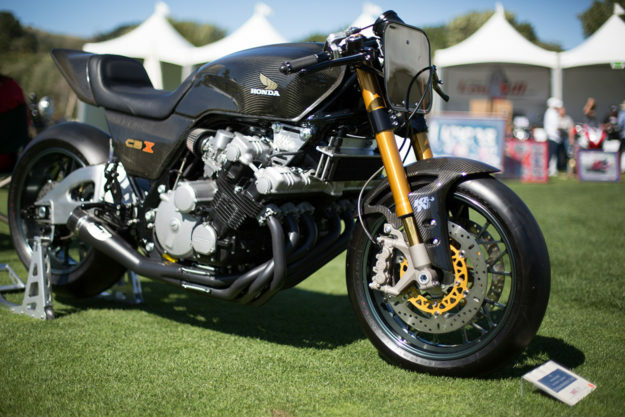 Nick O’Kane of K&N showed off his 1981 Honda CBX, a track bike with carbon fiber bodywork, 17-inch wheels and an incredible 6-into-1 exhaust system. 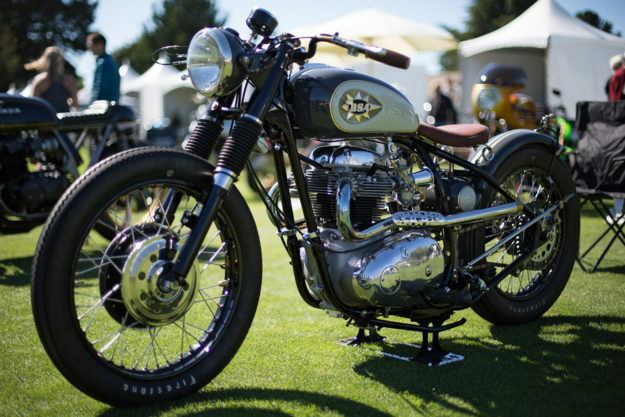 Richard Mitchell’s hardtail BSA A65L just oozes old school cool. It took over two years to build, and it shows—the detailing is amazing, right down to the tiny drilled heat guards on the pipes. 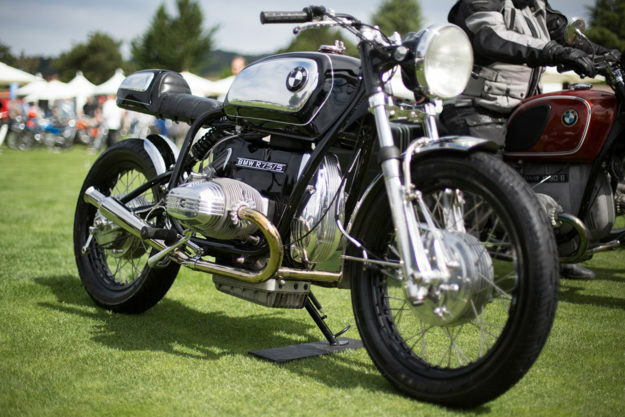 Bryan Fuller took along his BMW R75/5 ‘Bavarian Knight’ custom. It’s a mesmerizing mix of vintage and modern: the cabling is period correct, but the battery is a lithium ion. Note the gas cap with a Grolsch beer bottle style fastener. For many visitors, the chance to see Walt Siegl’s machines in the metal was a highlight. And the man himself was there too, which was just as well: he ended up on stage to collect a well-deserved Industry Award from Piaggio’s Miguel Galluzzi, designer of the Ducati Monster, Aprilia RSV4 and Moto Guzzi California. 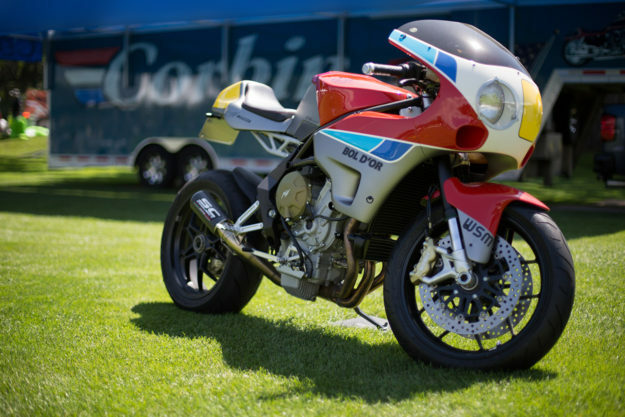 Mitch Talcove has squeezed a replica Vincent engine into the frame of a 1973 Ducati to create the ‘Vincati 1200.’ Not surprisingly, he took home the Innovation award. Chris Canterbury of Boxer Metal is a guy who thinks outside of the square. 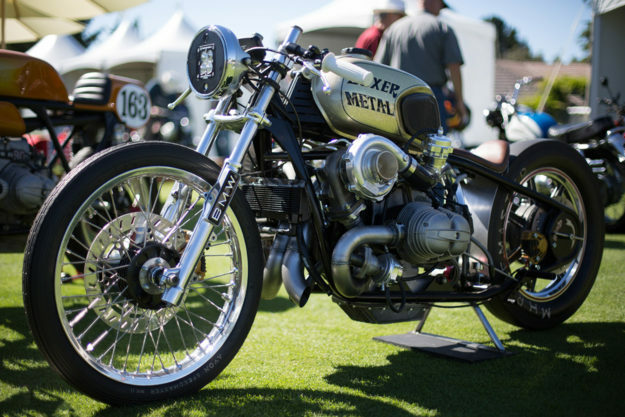 In a sea of cookie-cutter BMW customs, he broke the mold with this extreme twin-turbo R100. A show-stopper, literally and figuratively.